Click the map to download a pdf. Click here to view the Bald Hill Area Map with magnification. Bald Hill is a prominent peak located on the Saxtons River in Westminster two miles upstream from the river's confluence with the Connecticut River. Preserved forever from development by its purchase in 2008 by the Windmill Hill Pinnacle Association and by accompanying conservation easements, the 55-acre Bald Hill Reserve and the adjacent Bellows Falls Union High School Forest* and Basin Farm trails total over 300 acres and are part of a large, rural, riverside landscape for hiking and other non-motorized, public recreational and educational uses. 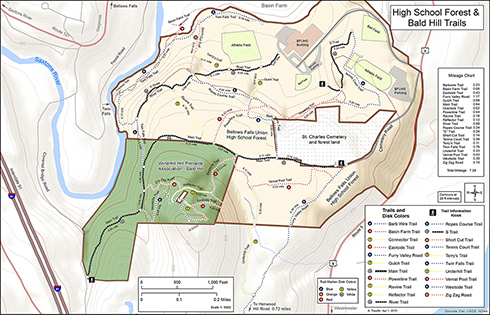 According to the WHPA/Bald Hill Land Management Plan, “The fundamental management objectives for [Bald Hill] are conservation on the one hand and recreation and education on the other, in roughly equal balance.” Therefore the Bald Hill Conservation Committee joined with the Bellows Falls Union High School to put in place information kiosks, new trails, trail markers, directional signs, and maps to encourage low-impact recreational and educational uses. Similar trail improvements will be installed at Basin Farm. Additional future plans of the Bald Hill Conservation Project include connection via public trails to a Bellows Falls Historical Society park currently under construction. 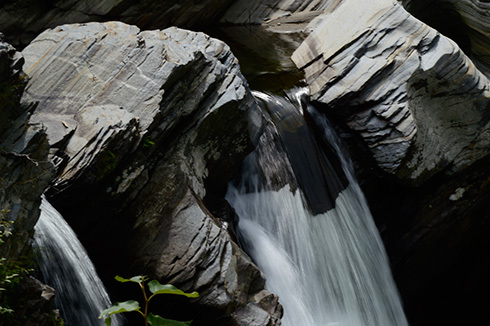 From Bald Hill hikers presently can follow existing trails down past a beautiful gorge, dramatic Twin Falls, and the Saxtons River. Soon Basin Farm trails will be open and marked as well. Crossing the Saxtons River and hiking another lovely gorge will lead to the River’s mouth, then north along an existing Connecticut River trail to the park. The completed trail system will offer a country hike that few have explored in its entirety and will be a distinct asset for the Town of Westminster and the Village of Bellows Falls! Within the High School Forest and Bald Hill Reserve today, there are more than 7.28 miles of trails readily accessible for hikers. Trail Descriptions, “Rules and Courtesies for Use”, and Maps are available at three trailhead kiosks: near the High School front parking lot, at the end of Cemetery Road off Route 5, and at 232 Covered Bridge Road in Westminster. The Bald Hill Conservation Committee invites you to participate in these trail projects. To register with the Committee and find out ways you can help, call Randy Major at 802-387-5737 or email majorrandy71@gmail.com. *The Bellows Falls Union High School owns the largest parcel of land of any public high school in the State of Vermont, 207 acres! Barbwire Trail 0.23 mile: Climbs from Ropes Course Trail, soon crosses Powerline Trail, and turns left to cross through level woodland to emerge on Main Trail not far from Cemetery Road. Eastside Trail 0.42 mile: Starts at Main Trail and soon is rising up the steep slope of Bald Hill. The lower part is a former logging road. In just over a tenth of a mile, the trail makes a sharp left and becomes a footpath that then switchbacks up the hill three times to reach the summit area. This trail is a very pleasant way to reach the top. Wildflowers include hepatica and rattlesnake plantain. Main Trail 0.94 mile: From the end of Cemetery Road west to 232 Covered Bridge Road. Level as it crosses High School land, it becomes gently hilly and crosses two brooks within the Bald Hill Reserve. It is wide, and part of it is a power-company maintenance right-of-way. Both ends have kiosks and are gated to prevent non-authorized motorized vehicles. Powerline Trail 0.44 mile: Most easily accessed from a trail kiosk visible across the High School front parking lot (see “S” Trail description). Climb from the kiosk 100 feet, passing under the power line, and turn right at first opportunity onto the beginning of Powerline Trail. Through pleasant woods at times, and within a low-power transmission-line right-of-way at others, the trail rises relatively easily until it meets the Main Trail. Near its lower end, Tennis Court Trail begins on its left. Farther up, Ropes Course Trail begins on its right, and just a bit above, the Barbwire Trail crosses. Powerline Trail ends at Main Trail and offers many vistas of nearby lands, including Fall Mountain. Because of the abundant sunlight that reaches the ground in the right-of-way, the trail passes through an abundance of wildflowers, including some rare ones, as well as plenty of invasives! Ravine Trail 0.19 mile: From Main Trail drops down across a long hemlock slope to join the River Trail. It is a convenient route to take between Bald Hill and Twin Falls. Reflector Trail 0.13 mile: Connects Eastside and Westside Trails a little way below the Bald Hill summit. It is quite steep, but has been used traditionally to reach the reflector itself and the most elevated section of the power line crossing a shoulder of Bald Hill. River Trail 0.48 mile: From the west end of the High School building to the Twin Falls Trail. River Trail passes behind a shed in mixed hardwoods, skirting an athletic field on its right. It intersects the Gulch Trail on the left and Terry’s Trail on the right before beginning to climb quite steeply up to the next plateau level, on the edge of which it meets Short Cut Trail on the right and Ropes Course on the left before continuing upward less steeply to Ravine Trail on the left, before slanting down across a slope of predominantly hemlock woods to join Twin Falls Trail. Ropes Course Trail 0.24 mile: Mostly level along the edge of a plateau between Powerline Trail and River Trail. It passes interesting rope and climbing structures not currently in use. Barbwire and Gulch Trails both terminate on Ropes Course, right opposite each other. “S” Trail 0.24 mile: Named after its shape on a map, this trail meanders up from the High School parking-lot kiosk, then turns left (north) and terminates at a sign in open space near the High School drive, the ball field, and tennis courts. Please DO NOT take a short cut from “S” Trail down to (or up from) the High School parking lot as the site is seriously eroded. Shortcut Trail 0.14 mile: Runs between Twin Falls and River trails. It is mostly level, but rises steeply at one point between plateaus. Terry’s Trail ends on it. Tennis Court Trail 0.39 mile: Starts at a sign in an open area above the High School drive (near “S” Trail terminus), curves left around and above the tennis courts and athletic field, then curves right and terminates at Powerline Trail. This trail offers impressive views across the athletic field and the valley. There is one bench nicely placed for a relaxed viewing! Terry’s Trail 0.11 mile: Named after a young woman who first ran it to avoid the very steep slope on Shortcut Trail! It connects River and Shortcut trails and stays on the same plateau through sweet-fern scrub. For a pleasant, relatively short walk from High School parking, take River, Terry’s, Shortcut, and Twin Falls trails, totaling a half mile on level ground. Twin Falls Trail 0.78 mile: Extends from behind the High School building to Main Trail within the Bald Hill Reserve. It first follows the top edge of a steep slope offering pleasant views across Basin Farm. It runs along the edge of a High School practice field, then enters the Forest and soon comes close to, but well above, the Saxtons River. It follows the course of the river with occasional dramatic views and arrives at a point just above Twin Falls (no swimming allowed!). Twin Falls Trail then divides, with the wide cross-country running trail providing a shortcut away from the riverbank. The experienced hikers’ trail forks to the right, crossing boulders and following along near the top edge of the Twin Falls gorge, at some points offering dramatic but HIGHLY DANGEROUS views off a precipice with a vertical 35-foot drop down to the river’s rocky edge and rushing waters! The alternative trails rejoin within 500 feet and traverse uphill to Main Trail. Underhill Trail 0.33 mile: From Furry Valley Trail to Vernal Pool Trail. Near Furry Valley Trail, Underhill Trail passes a stone foundation, probably of an 18th- or early 19th-century barn. The trail leads the hiker along the base of Bald Hill that rises very sharply, incongruously, from the flat plane of the plateau. Side trails off Underhill are not to be taken as they are private. Underhill Trail ends back on High School land at the Vernal Pool Trail. Vernal Pool Trail 0.43 mile: Leaves the Main Trail 500 feet from Cemetery Road, and offers a separate entry from Furry Valley Trail. 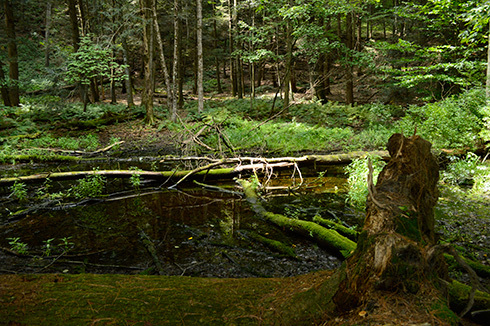 It passes through a grove of towering pines left for hikers’ enjoyment by the logging operation, which is otherwise in evidence along this trail, and passes its namesake — a vernal pool in the High School Forest — before emerging at the junction with the Eastside and Main trails on Bald Hill land. A very short side trail leads down to the vernal pool. Westside Trail 0.30 mile: Begins on Main Trail one-quarter mile from the Covered Bridge Road/Bald Hill trailhead. It switchbacks up a remarkably steep slope through mixed woods to reach the reflector, which is part of Trans Canada’s microwave communication system connecting power-dam sites along the Connecticut River. From near the reflector, you can on clear days see landmarks in Bellows Falls, the Connecticut River farther north, and Mt. Ascutney 25 miles away. Just beyond the reflector, the trail turns right and is soon at the wooded summit. Zig Zag Road 0.14 mile: Shown on the map, it is NOT recommended for use — especially for descents — as a result of a dangerously steep, washed-out ledge covered with marble-like, slippery pebbles. Note: The names of the High School trails were provided by Tim Eno and Russ Pickering, current and retired track coaches. © 2018 Windmill Hill Pinnacle Association | whpa@sover.net Windmill Hill Pinnacle Association is grateful to FirstLight for Internet support.